Boston, Massachusetts, circa 1904. "Yard and tracks, South Terminal Station." 8x10 inch glass negative, Detroit Publishing Company. View full size. Submitted by eponymous roadster on Fri, 03/30/2012 - 7:25pm. Is that fire shooting out from the chimney of the tall building on the far left, or is it just the result of a deteriorated negative? If it's fire, there must be a lot more going on inside the building that can't be seen. Submitted by Zcarstvnz on Fri, 01/13/2012 - 4:30pm. The W.O.W. marking on the tank car stands for the Wilburine Oil Works, Ltd. which was essentially a subsidiary of Valvoline Oil Company (97.04% of stock was owned by Valvoline by 1898). A predecessor company of the American Association of Railroads (AAR) later assigned the "WOWX" mark to Wilburine rail equipment and they used this mark during the period 8/1920 - 7/1923. Valvoline Oil Co. used the "WOWX" mark after 7/1930. Car number 225 shown here is listed amongst Wilburine's holdings in the Official Railway Equipment Register for September 1901. In fact, the next car number, car 226, is the highest number shown. Originally an abbreviated company name alone was used to designate the owning company of a railroad car. With the growth of international and transcontinental shipping a standardized naming convention was introduced. Most companies retained their old abbreviations, but suffixes were added to differentiate various type of shipping equipment. The letter "X" designates a commercial railcar. Sometime after 1911 but definitely by 1917 Valvoline was using the VOWX (Valvoline Oil Works, Ltd.) mark and Wilburine was using the WOWX mark. The W.O.W. car sitting in the yard makes sense because steam trains needed lubrication for their valve gear(s). Valvoline was a principle supplier of this type of oil for more than 70 years. Valvoline was founded in 1866 as the Continuous Oil Refining Company by Dr. John Ellis. The name “Valvoline” was established in 1868 (VALVe OIL [for the] LINE) and it was trademarked in 1873. Valvoline Oil Works and Wilburine Oil Works finally merged in 1925 according to Moody’s' Industrial Manual (1929 edition, Volume 1). Submitted by Paul Cutler III on Thu, 10/28/2010 - 9:43am. South Station is only 9 years old in this photo. All 28 tracks are in use, and at this time it is the busiest passenger terminal in the world. It was capable of handling 8 simultaneous train movements through the yard throat. This picture most likely was taken from the drawbridge control cabin over the Fort Point Channel. This 3-bridge, 6-track structure was only torn down in the past 10 years or so for the Big Dig. 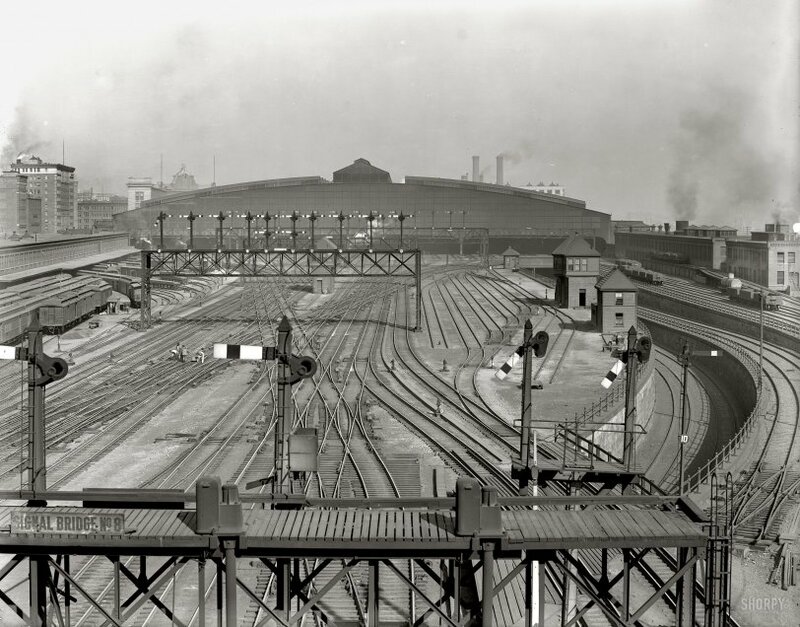 The large train shed was torn down in the 1930's due to the expense of maintaining it and the corrosive effects of the coal smoke on the steel and concrete structure. Not to mention keeping the glass clean. The building on the left is the outbound express building, which was originally used by a predecessor of the Railway Express Agency. Most if not all the cars in the photo are wood framed cars. The 3 cars behind the leg of the tower are especially ancient with their flat arched roofs. The building on the far right is the power plant and gas plant for power and lighting of the station (replaced by the South Postal Annex in the 1940's). The coal carrying cars are of the drop bottom gondola type, rather than a true hopper car. The reporting marks on that old tank car is "W.O.W. ", and I have no idea what railroad or shipper that is. The two ramps on the right lead to the abandoned underground commuter loop. This was to be used with electric commuter cars like the ones used on the Nantasket Beach Branch of the New Haven Railroad. This was center 3rd rail, like Lionel toy trains. Safety complaints and projected expense kept the New Haven from electrifying all Boston commuter traffic like it wanted to. South Station was the 1st terminal in the world to be designed for electric trains, and yet it didn't happen until the 1990's for Amtrak on the upper level. The reason for two ramps is that the one on the right was to be used for all Old Colony RR lines to the South and East, while the ramp to the left was to be used for all Providence, Franklin, Needham, Dedham, and Stoughton lines. From what I read, they tried to use the loop once with a steam engine test train, but almost killed everyone on board due to the total lack of ventilation. The loop station was used at various times as a parking garage and a bowling alley. It was not fully removed until South Station's reconstruction in the mid-1980's. The Atlantic Street wing of the station (visible at left) was torn down before preservation efforts started. It was rebuilt much wider in the 1980's for a food court. They reopened the same quarries used in the 1890's to get the same color granite. The Summer St. wing was shortened by half for the Stone & Webster tower. All of South Station was owned by the Boston Terminal Co., which was jointly owned by the railroads that had their own stations replaced by South Station: Old Colony RR, Boston & Providence RR, Boston & Albany RR, and the New York & New England RR. Each RR owned 20% of the BTCo., plus the New Haven RR which owned the OCRR, NY&NE, and B&P (giving the NHRR 80 percent control). Today, South Station is at 13 tracks, yet it has more scheduled trains than in 1940. There is serious talk of moving the Post Office out, and expanding the track diagram to 20 tracks. Submitted by Anonymous Tipster on Thu, 01/21/2010 - 2:29pm. The filth (and smelliness) of cities at the time when coal was widely used for heating and, as here, railroading would astonish people today. Many buildings in Milwaukee were built in the 19th century from a local clay that's light tan in color -- "cream city brick." But they didn't stay cream-colored for long, thanks to the coal soot belching out of every chimney. Downtown still has many of these brick buildings, and while many of the more prominent ones have been scrubbed back to their original color, lots of others -— the less important ones, and those on side streets — still have the blackish patina they acquired before about 1960. Submitted by Steamcrane2 on Wed, 01/13/2010 - 4:10am. These are "double slip" or "puzzle" switches. They combine four switches and a diamond crossing in only slightly more track length than a single switch or crossing. Very common at big passenger stations, due to the tremendous space saving, but hard to maintain, thus very rare outside that context. I hand built one in HO some years ago, doubt that I will ever build another. I count 28 of them in the picture, plus many conventional switches. Handling all those switches isn't that stressful, since there is a mechanical interlocking frame in the tower to prevent lining up conflicting routes, and the switches are thrown pneumatically. There is a large track diagram in the tower, with every switch and signal numbered, to use as a guide. However, keeping trains moving in and out efficiently is highly skilled work, little different from air traffic control. These tower operators would "have a lot of whiskers," or high seniority. It appears that at lower right, the ramp track to the lower level was in the process of being abandoned, I vaguely remember reading references to that, apparently the lower level platforms didn't work out as planned. There is also evidence of some track rearrangement in the form of extended ties and switch machine parts at lower center, just beyond Signal Bridge 8. Regarding the cars at the left, passenger trains were the airliners of the day, and carried much more than passengers - mail, express parcels (Railway Express and its competitors, the FedEx of the era), and perishables. In many metro area commuter zones, including Boston, milk was carried from farm to the city in special refrigerator cars cut into passenger trains. What a mess of double slip switches that is! Submitted by mackb4 on Wed, 01/13/2010 - 1:39am. Those switches are double slip,meaning that each one handles the duties of two normal switches. Submitted by Anonymous Tipster on Tue, 01/12/2010 - 10:55pm. Really love the geometry of the tracks. I pass through this station every day on my way to the office in downtown Boston. Submitted by sjmills on Tue, 01/12/2010 - 10:49pm. Submitted by Anonymous Tipster on Tue, 01/12/2010 - 7:23pm. I'm curious what those railcars on the left would be used for. Submitted by John Howard on Tue, 01/12/2010 - 7:18pm. Being in charge of switching all those rails correctly, every time, must have been one heckuva stressful job. And probably sold a lot of headche powder and Bromo Seltzer, too. Submitted by Dag on Tue, 01/12/2010 - 6:17pm. Wonderful photo of a building that still exists. You can see the back of the clock and eagle which stand above the front of this station. The station has been remodeled, fortunately the facade of the building was preserved, the interior has been changed. Progress, some people say. Submitted by uncle scrooge on Tue, 01/12/2010 - 5:15pm. Bet you can't model that switchwork.